Russia’s most reliable transport helicopter, the Mi-26, christened “the flying cow” by its pilots, is legendary for the variety and volume of equipment it has carried. RIR highlights some of the more unusual cargo the Mi-26 helicopter has transported. Russia plans to build seven to eight variations of the Mi-26, the world’s most powerful cargo helicopter, with a variety of modifications, including some for foreign customers, in 2015. The manufacturers of the Mi-26, known by its pilots as “the flying cow” for the huge amounts of cargo it can carry, say they will ramp up production because there is a growing global demand for heavy cargo helicopters. Despite over three decades of service, the Mi-26 still remains the star of the air salons because of size and virtually unlimited capacity to transport all kinds of goods. 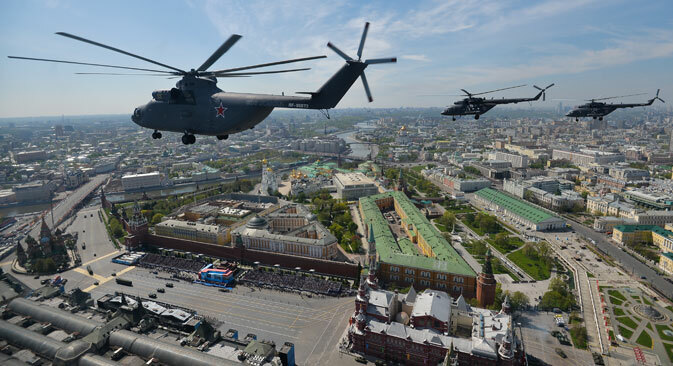 RIR highlights three of the most unusual cargoes the Mi-26 has transported. The “flying cow” as Mi-26 pilots have christened the aircraft, has an impressive record. They have been used in Somalia, in Cambodia, in Indonesia, in the former Yugoslavia as part of peacekeeping operations for the UN, and have doused fires in Greece. The Mi-26 has even assisted the American armed forces. NATO hired the Russian aviation company Vertical-T to deliver cargo in non-military zones in Afghanistan. In 2002, in the mountains of Afghanistan, when an American CH-47 Chinook military transport helicopter was shot down, they decided to remove it from the site and send it for repairs, to reduce the figure of military losses. While the repairs would cost the Americans a great deal, it was worth it because a repaired helicopter would not be considered “shot down”. The most difficult task however, remained, to evacuate the damaged aircraft. The Americans initially tried to lift the helicopter using another Chinook, but this was unsuccessful. Then it was time to call in the Russians. Russian pilots needed three hours to connect the cables to the Chinook and took off with this load to the Bagram air base 400 kms away, making two landings for refuelling. On 2 February 2012, the Mi-26 lifted the largest jet plane in Soviet history – the Tu-134. The airplane had been written off as having outlived its usefulness and had to be delivered from St. Petersburg to a test site in Nizhny Novgorod to be used by the special forces for anti-terrorist operations. To collect the “Whistler” (as the Tu-134 was known, because of its characteristic engine noise) it was necessary to remove the aircraft’s engines and cut off the wings. Even at their reduced length, the wings were 30 meters long, and the weight of the fuselage was more than 40 tons. It was very dangerous to externally transport such unusual cargo hanging on cables as even a gust of wind could cause the helicopter to go downward. The Mi-26 succeeded in lifting the Tu-134 in its first attempt. However, given the recalcitrant nature of the airplane, the helicopter had to fly backwards as it was unable to turn the Tu-134’s fuselage against the wind. The pilots managed to correct the position of the airplane after a while and the Tu-134 was transported safely, according to plan. However, in the interests of driver safety, the St. Petersburg-Pskov highway was closed for the duration of the transportation. Automobile drivers stuck in the traffic jam witnessed this unusual duet, but were not immediately able to understand what was carrying what! After all, the Mi-26 is, in terms of size, more modest than the Tu-134. In May 2015, the Mi-26T carried out a unique transport operation; it essentially transported itself. On the external cable of the helicopter was a 14 ton fuselage of the same model Mi-26, which needed to be delivered from Ioshkar Ola to Rostov- on the Don for repairs. There was no alternative but to lift the huge body of the Mi-26. The “flying cow” was the only aircraft capable of lifting a cargo of similar weight and dimensions. “The operation to transport the fuselage took nine days,” said Valeriya Chumakova, the Rostvertol-Avia commander and the Russian Helicopters press service. “The route went through Cheboksary, Ulyanovsk, Saransk, Penza, Saratov and Volgograd. The weather along the route was extremely varied – from winter to summer, but there were no difficulties. I have worked on the Mi-26T for more than 15 years and can say with certainty that this aircraft, like no other, is built for these sorts of operations”.